That's not necessarily true Mr Orange n Iowa. Back around 1-July when all 32 clubs had to submit to the league whether they'd be wearing their color or white jerseys for each of their 8 home games does not (and someone correct me if I'm wrong on which color) lock them in as to whether it's their regular, alternate, or throwback color jersey. 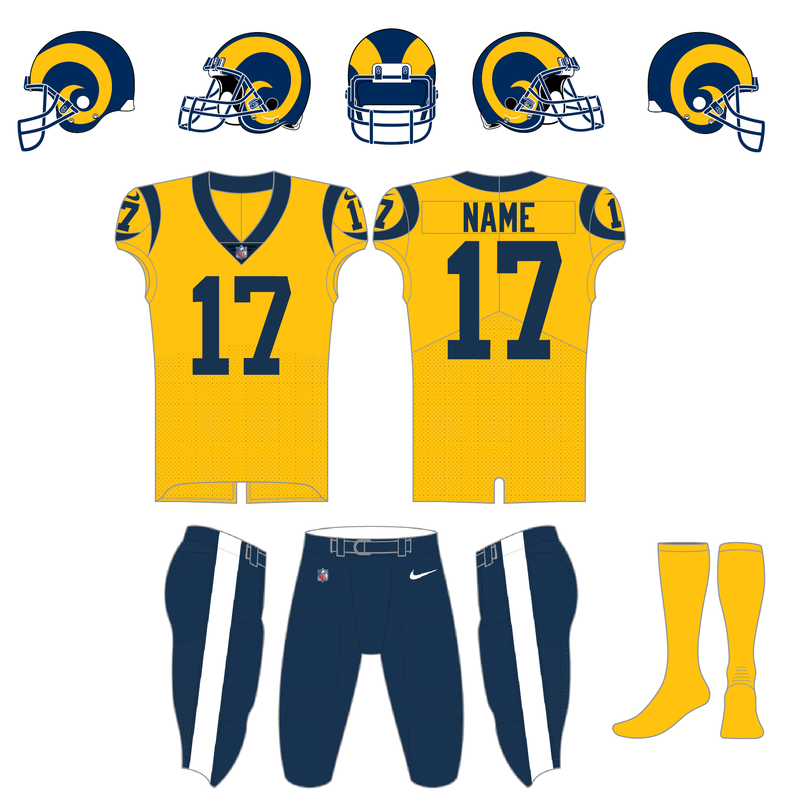 Also, socks and pants are an open option up until game week, so the Rams could wear their Royal Blue or Yellow jersey, I do not believe they're locked in UNLESS the deal they got from the NFL was that the royal blue throwbacks are worn 5 games at LA Coliseum. Either way, they should be able to decide which pants and socks they desire to wear, KC already knows they're in white jerseys. However after much protesting to the NFL by the Rams on behalf of the fans, the League made an exception to them regarding the royal blue throwbacks. Upon that NFL exception it was announced that LA would wear the white jerseys for the first two home games, royal blue throwbacks for the 5 home games, and the yellow color-rush for games in SF and the Mexico City (home game designate). 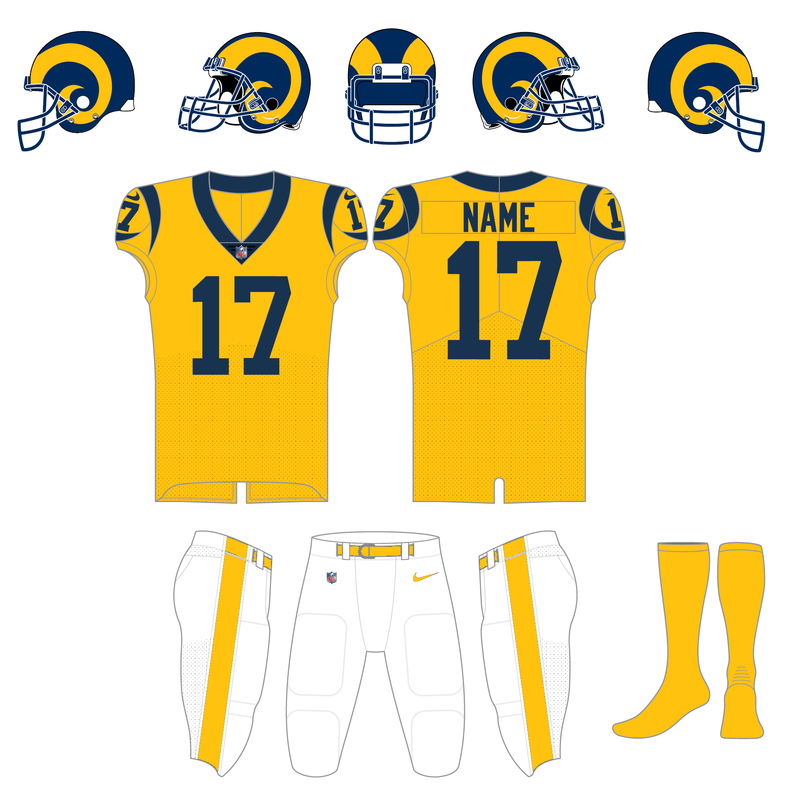 So .... if they're locked into wearing the yellow jerseys as was announced in summer (which I doubt the NFL would force upon them) they should still be able to wear whichever pants and socks that they so choose, IF the NFL insists on the Rams having to wear the yellow jerseys even with this switch of venue. My guess is they still will wear the yellow jerseys as that is also considered a Los Angeles Rams throwback jersey from the 1950s. If so, stay tuned regarding pants and socks. I like Ben in LA's preference of white pants and blue socks with the yellow jerseys. Blue pants with the yellow jerseys looks great in Madden. That sounds awful. The solid white stripe on the navy pants would stick out like a sore thumb with the navy and yellow color scheme of the CR helmets and jerseys. Or if you want to have an extra, a nice Mustard vs. Ketchup-and-Mayo match. What if the Rams make the Super Bowl and have to wear the mismatched garbage unis and not the GORGEOUS throwbacks or Color Rush options? I hope they wouldn't wear the old gold and white and navy drab jerseys in the playoffs! man, these are great. 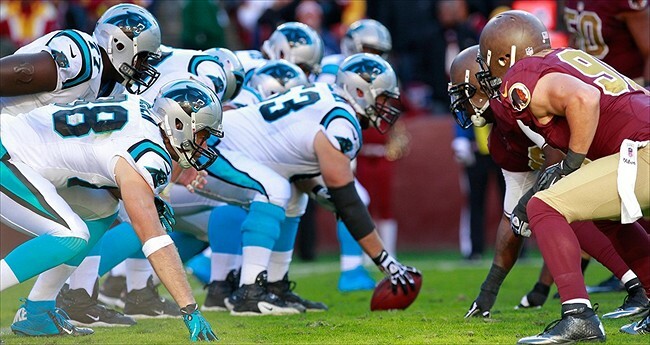 Wish Carolina or Titans had a similar colored helmet. Rams being contenders as they decide to have mismatched uniforms is the worst timing ever. I think it's been established that the throwbacks are their standard home uniforms for the time being. And luckily the NFC is home this season for the Super Bowl so that is what we would see. Chances are we won't see them play on the road much in the playoffs before their new design in 2020 anyway. 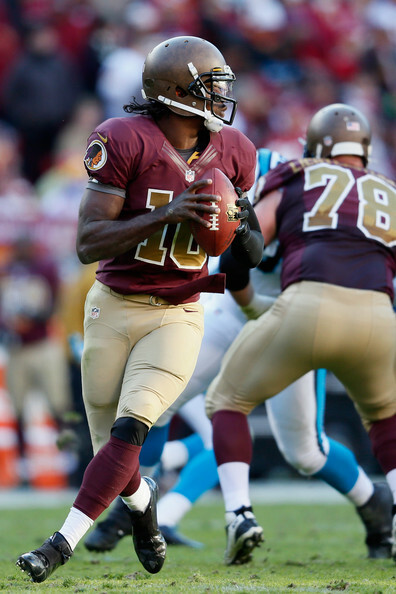 Due to the ridiculous one-helmet only restriction it's quite an injustice that the Redskins fans along with the rest of us are being deprived of getting to see the Washington throwbacks as they were designed to look, with that leather simulated schemed helmet. Wearing the current helmet really cheapens what was originally a really good look I thought. You're right about the current blue pants, but the current white pants with the single thick navy side striping could work with the yellow C-R jersey. The CR jerseys would look great with white pants . . especially if they were they ones worn in 1994 for NFL-75 which they don't currently possess. 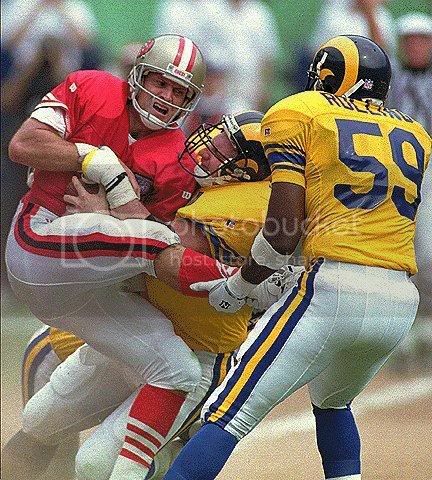 That NFL-75 throwback was as close to their 1950s look as they could get with the exception of the 1994 helmet. Looked really good back then I thought. According to our friends from 'Gridiron Data Base' the Rams will still be in the full yellow C-R even with the change of venue to LA but KC they're not sure which they'll wear. I doubt KC will wanna wear mono-red for a 2nd time this season, so we'll see. I wouldn't be surprised if the Chiefs were to go white on white for the first time this season. According to the Ravens Gameday, they’re due to be in black again? Don’t know if that means black/black or black/purple. Jaguars wearing Teal tops, Black pants. This is the 3rd time in Teal meaning Teal on Teal will be the only uniform combination not seen this season. I think the pants I used either had no stripe or had the low key gold from the old pants. :censored:ing awful is a bit dramatic considering the current Rams road uni lol. Boooooooooo. Give us the greens (don’t do the green end zone though). I was so looking forward to all white Packers vs all green Seahawks. Is there any real evidence that proves the 1-helmet rule is safer for players? So now for Week 14 on Sunday night we're gonna get the Rams on the road in mismatched white horn helmet with gold accent jersey vs. the Bears in navy. Pitiful. Also the Titans will shockingly be in white over navy, which is an abomination. Why does team that wears the same damn ugly monochrome combo at every home game bother to announce it? I'm going to announce that I'll be using the bathroom tommorow.